The fashionable reverse S-curve silhouette of the dress and the dramatic scroll pattern of the textile reflect the influence of the Art Nouveau movement. The striking graphic juxtaposition of the black velvet on an ivory satin ground creates the illusion of ironwork, with curving tendrils emphasizing the fashionable shape of the garment. In order to achieve this effect, the textile was woven à la disposition, with the intent that each piece would become a specific part of the dress. With this technique, the design of the fabric is intrinsic to the design of the dress. Maria Grazia Chiuri and Pierpaolo Piccioli conceived an idea of padded rouleaux, scrolled into raised decorative patterns on the surface of the fabric, to suggest the elaborate wrought-iron gates hiding the mystery within. 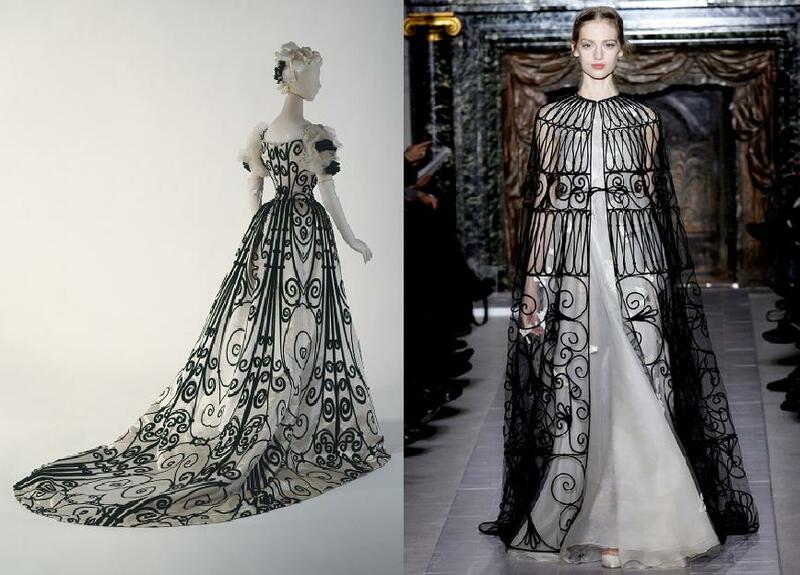 The idea of the dress was a bird in a cage, which was superbly executed by taking many different laces and re-embroidered them to create shimmering collage effects like a late Monet garden-scape.